Just because some pilgrims told you to make turkey for Thanksgiving, doesn’t mean you have to. 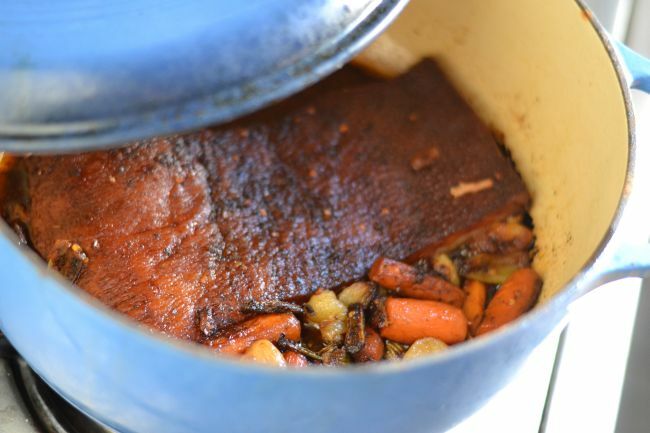 I mean, wouldn’t you rather have braised pork belly? I know I would. 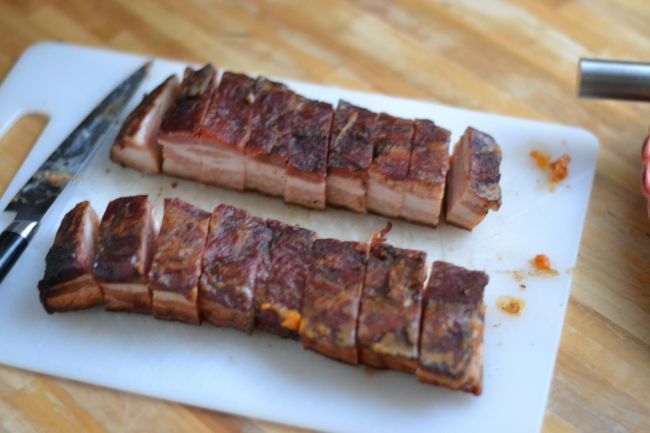 Making delicious pork belly is easier than it sounds. Here’s one of my favorite secrets (out of all my other favorite secrets): If you have a good butcher shop nearby that cures their own bacon, then you have a friend for life. In this case, I ended up going to Whole Foods and getting a 3 pound piece of their andouille cured bacon. Using bacon instead of raw pork belly will bring you much happiness. It has been cured and smoked, so it’s already better than regular pork belly for those two different reasons. 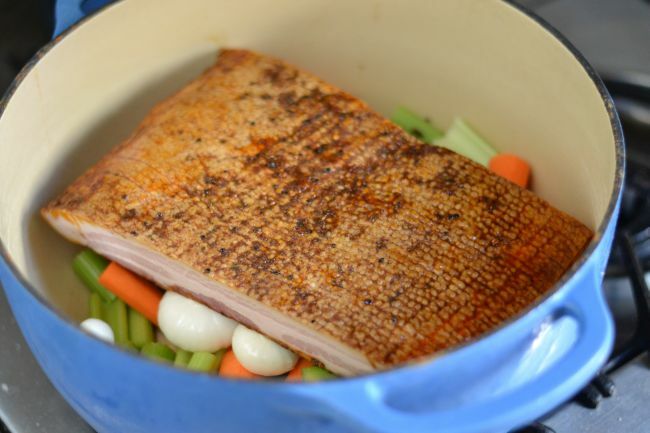 In the bottom of a heavy pot with a lid (like a Dutch oven pot, for example), you want about 4 cups of celery, onions, and carrots, and one cup of chicken stock. Pop that slab of bacon right on top, put a heavy lid on it, and stick it in the oven at 325°. Put on a movie like Ghostbusters or Jurassic Park and chillax. It will be tender and awesome in about 2 1/2 to 3 hours. 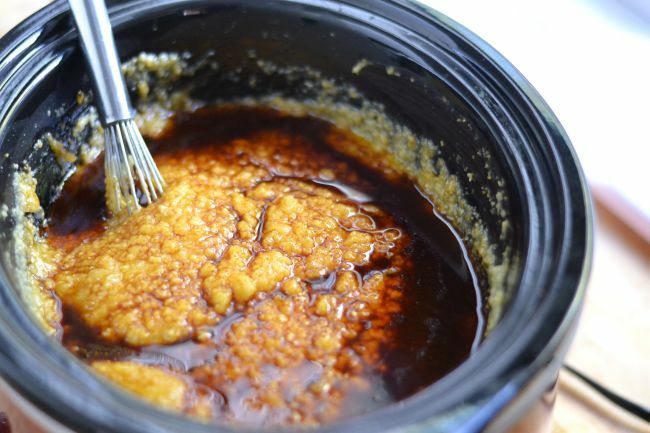 At the same time, you can put 2 cups of polenta and 5 cups of chicken stock in a crockpot on high. Don’t worry too much about it – just stir it every once in a while. When the pork is nice and tender, pour the juices that came out of it into the polenta. Season the polenta with a little bit of salt and pepper and maybe four big juicy tablespoons of mascarpone cheese. If the vegetables didn’t get too roached from roasting the pork, then they will also be super delicious and I recommend eating them. 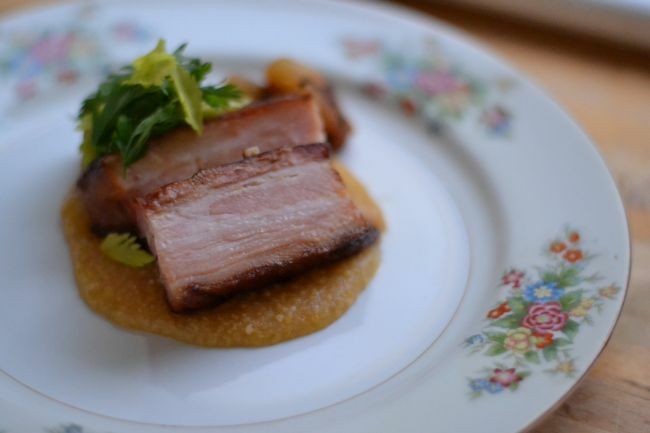 If you’re doing it family-style, I would just dump the polenta onto a platter and put slices of pork belly on top. Maybe garnish it with some of the leaves from the celery and some of the greens from the carrots. If your butler is serving your Thanksgiving dinner in courses, I would have he or she put just a couple of spoonfuls of the polenta down on grandma’s finest china with a couple of very nice slices of the pork belly on top. To me, this beats the heck out of dried up turkey any day of the week.